Dimensions 1 by 4 by 7 in. About: Bob Howard—a T-shirt–wearing computer geek and field agent for the super-secret British government agency The Laundry—must save the world from eldritch horrors, codenamed Jennifer Morgue, in this fast-paced spy thriller. 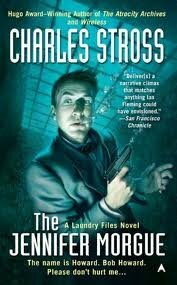 About: Bob Howard, geekish demonology hacker extraordinaire for "The Laundry," must stop ruthless billionaire Ellis Billington from unleashing an eldritch horror, codenamed "Jennifer Morgue," from the ocean's depths for the purpose of ruling the world.